The line-item veto isn’t a new concept. In fact, the governors of 44 states have the power to reduce or strike appropriations passed by legislatures. State lawmakers would have the ability to override the reduction or veto of a specific line item the same as they would an ordinary piece of legislation. The only states that do not grant this authority to governors are Indiana, Nevada, New Hampshire, North Carolina, Rhode Island, and Vermont. The line-item veto can be a powerful tool to reduce spending or reduce waste, particularly in instances in which the branches of government are not controlled by the same party. But it is not a panacea. Although the process for the Consolidated Appropriations Act was terrible, it also spent $1.3 trillion, nearly $300 billion above the spending caps established in 2015. Nevertheless, one may wonder why the president does not have the ability to reduce or strike appropriations in the same manner as 44 governors? The line-item veto was a core component of House Republicans’ “Contract with America” during the 1994 midterm election. In 1996, Congress passed the Line Item Veto Act, S. 4, which was sponsored by Sen. Bob Dole (R-Kan.). President Bill Clinton signed it into law. The bill amended the Congressional Budget and Impoundment Control Act of 1974 to give the president the ability to rescind discretionary spending, any new mandatory spending, and limited tax benefits. 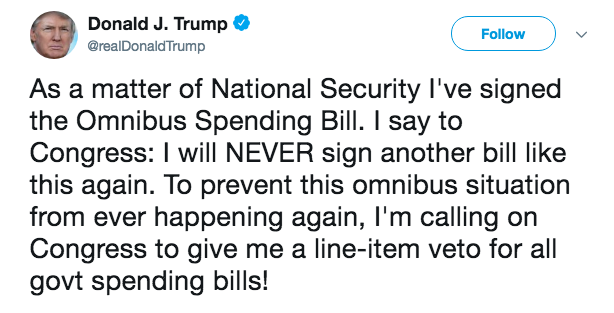 Congress had the ability to cancel any line-item veto, within 30 days, through a resolution of disapproval, which could still be vetoed by the president and subject veto override. Unfortunately, the Line Item Veto Act had a short life. The law was immediately challenged in the federal court system by six members of Congress in Raines v. Byrd. Although that lawsuit was initially successful in district court, the Supreme Court determined that the senators did not have standing to challenge the law. In 1998, the Supreme Court invalidated the law in a 6 to 3 decision in Clinton v. City of New York, holding that the Line Item Veto Act violated the Presentment Clause found in Article I, Section 7 of the Constitution, which established the process by which a bill becomes a law. Passing a constitutional amendment is not easy, and it was not meant to be. Since the Constitution went into effect in 1789, it has been ratified only 27 times. We know the first ten amendments to the Constitution as the Bill of Rights. These amendments were ratified in 1791. The subsequent 17 amendments were ratified between 1795 and 1992. Now, to put it diplomatically, Congress barely functions. Article V of the Constitution requires two-thirds of the House and the Senate and ratification by three-fourths of the states. In such polarized political atmosphere, this is an insurmountable hill to climb. Indeed, Justice Scalia was right to point out that giving a president the power to cancel spending or including the “not exceeding” language is a distinction without a difference. There has been legislation since Clinton v. City of New York to revive the line-item veto. Whether it would survive a constitutional challenge is not clear since it never became law. In 2011, the House passed the Expedited Legislative Line-Item Veto and Rescissions Act, H.R. 3521, sponsored by then-House Committee Chairman Paul Ryan (R-Wis.). The bill would have given a president the ability to make recommendations for rescissions from an appropriations bill. Those recommendations would have received fast-track authority, requiring an immediate approval or disapproval from Congress. The savings from rescissions would have been required to be used for deficit reduction or a budget surplus. The Senate never considered the bill. Whether Congress passes some form of a line-item veto or begins including the “not exceeding” language in appropriations bills, it will do little to rectify concerns about federal spending. Remember, the Consolidated Appropriations Act only appropriated $1.3 trillion, which represents less than 30 percent of all federal spending for FY 2018. It would not address mandatory spending, including entitlement programs, which are more than 60 percent of federal outlays. Should Congress give President Trump what he asked for? Absolutely. Some form of line-item veto authority, either codified in statute or a constitutional amendment, or “not exceeding” language in appropriations bills may indeed be valuable. But it will not have a substantial impact on the deficit or address the United States’ long-term fiscal problems.